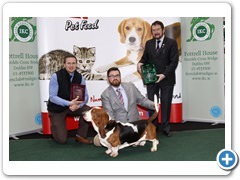 Points are calculated on group placings at All Breed & International Championship shows between 1st January 2015 & 31st December 2015. Points are allocated as follows G1 - 25pts; G2 - 20pts; G3 - 15pts; G4 - 10pts, an additional 5 points are awarded for Best In Show. Jimmy Duggan’s Siberian Husky, Ch, GB & Int Ch Bedarra Cold Paws Warm Heart For Leorient, handled throughout the year by Anita Foley-Duggan.